The TeraFlex JK 2.5" Suspension Budget Boost Lift Kit is the most economical lift for the JK Wrangler and will increase off road performance without breaking the bank. The budget boost is designed for JK owners who wish to lift their vehicle with the least amount of modification required. Several innovative features of the TeraFlex budget boost are found in the exclusive spring retention spacers that do not allow the spring to drop out during extreme articulation. 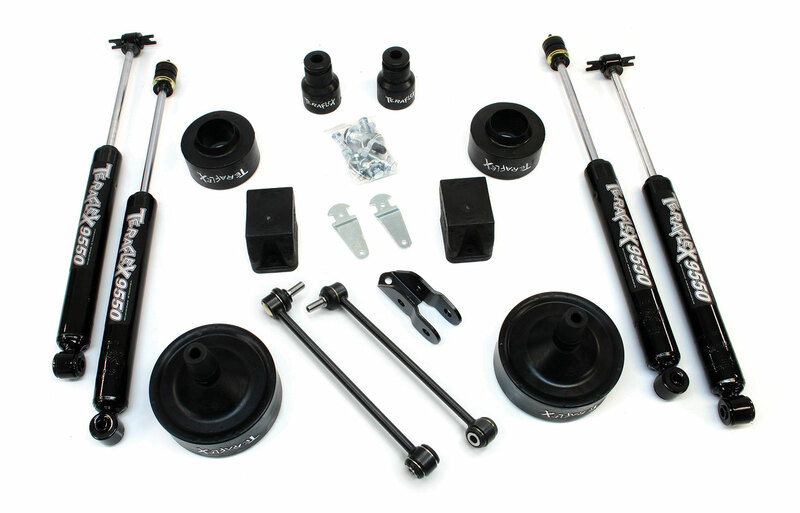 This kit includes 2.5" front spring spacers, 2" rear spring spacers, 9550 VSS shock absorbers, rear swaybar links, rear brake line extensions and all necessary hardware. This kit will allow you to run up to a 35" tire (aftermarket wheels with 4.5" backspacing or less are required). Fits all JK Wrangler models including Rubicon and Unlimited.